The original “naked” motorcycle, the Ducati Monster created an overnight sensation when it was launched over a decade ago. Today, it defines the class more than ever. An essential street fighter – with its fully exposed engine and bodywork – the Monster delivers style and real sport bike performance. This year, the Monster S4R, the first in the high-performance Monster SR dynasty, is joined by the new S2R. 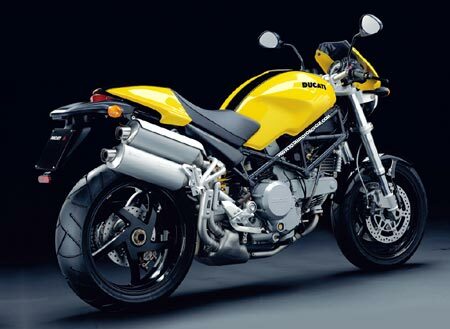 “Classic” versions of the bike, which have made this family so popular, include the agile 620 and the powerful 1000. The Monster has a relaxed and confidence-inspiring riding position combined with some of our most powerful Ducati Desmo, 90° L-twin engines. A Superbike trellis frame, fuel injection, computer engine management and the latest race-performance brakes and suspension guarantee smooth and capable road manners. When the going gets tough, the Monster S2R hits the gas and takes to the track. All the special features of the new model are in line with the acclaimed Monster S4R: aluminium alloy single-sided trellis swingarm, unique progressive rear suspension system with adjustable rear ride height, 5-spoke wheels, exhaust with double silencer mounted high on the right-hand side. And as if that wasn’t enough, the S2R also features oversized tyres and extra ground clearance, so that you can lean even further into the bends. An essential street fighter – with its fully exposed engine and bodywork – the Monster delivers style and real sport bike performance. * = The weight includes battery, lubricants and, where applicable, cooling liquid.